My best adventure this week was enticing hummingbirds to eat from my hand. I saw videos on YouTube of other people doing it and decided to try. The hummingbirds are migrating now, and they buzz around the feeders like huge bees. 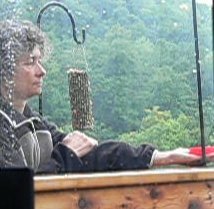 I removed one of the feeders, put a red plastic spice jar lid filled with sugar water in my hand, and sat quietly with my hand in the same place that the feeder had been. It didn’t take the hummingbirds long to get brave enough to try it. Here’s a video of them drinking from the lid. If you can’t click on the video, try this link. 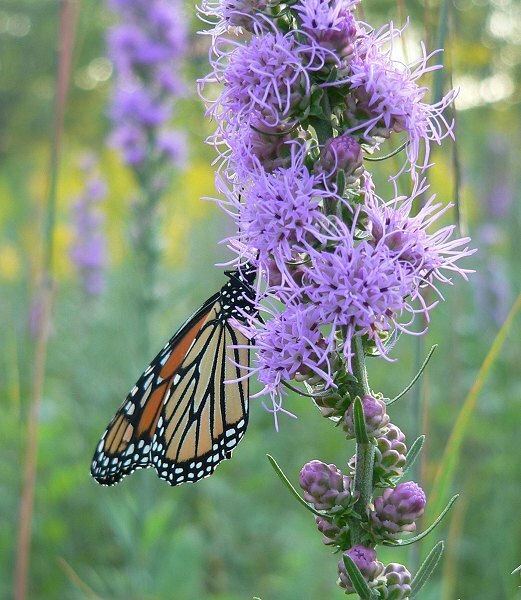 Rough Blazing Star is in full bloom right now – there are big patches growing in the Knife Edge Prairie and Hidden Oaks Meadow. Monarch butterflies are starting to migrate. I’ve been seeing groups of them resting on gravel driveways, and flying high and straight toward the southwest. 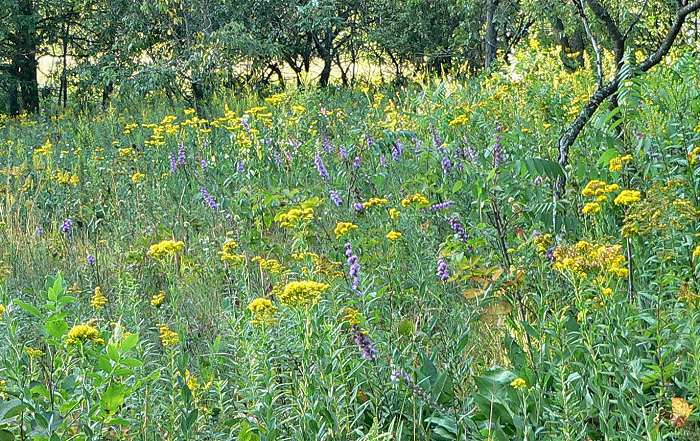 There have been a few Monarchs nectaring on the blazing star in the Knife Edge Prairie, and several more Monarchs flitting around the edges of the trees. They often rest in tree branches at night when they’re migrating. I found two unusual butterflies this week – both species that repopulate from the south every summer. One was a Dainty Sulphur – a very small yellow butterfly – I didn’t get a photo. 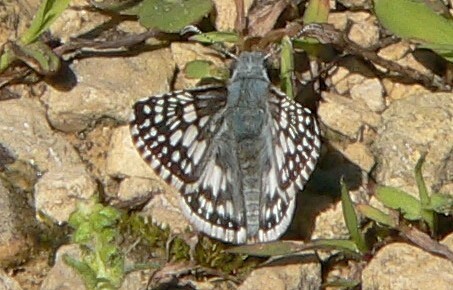 The other was a Common Checkered Skipper, which in spite of its name, is not actually very common in Wisconsin. Here’s a picture of an Eastern Tailed Blue – a fairly common small butterfly – but I like the way it’s wings caught the light. 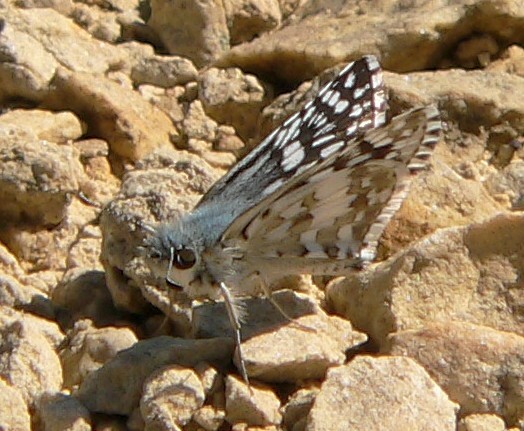 The top wings of the males are bright blue, but the scales sometimes catch the light so they look bronze or silver colored. 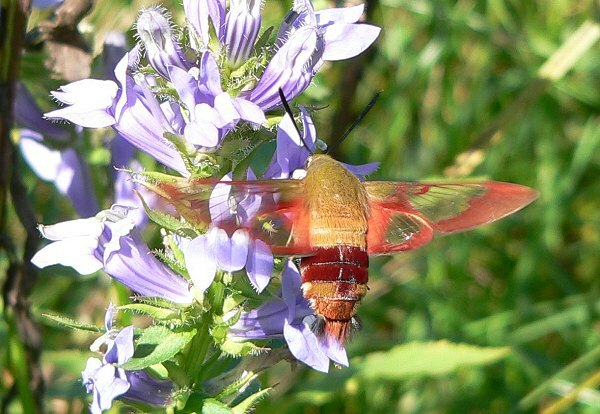 This is a hummingbird moth nectaring on Blue Lobelia – I’ve been seeing a lot of these beautiful moths. 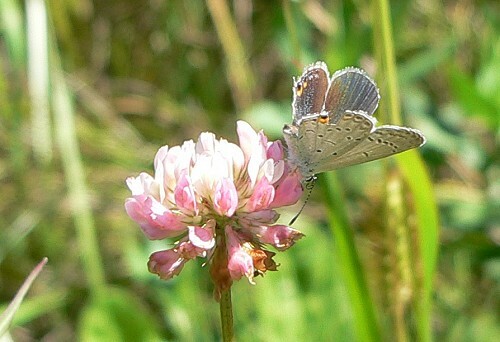 Their wings have a clear area in the center – you can see the flowers through the wings. The wings move so fast that they make a blur. It’s easy to mistake them for hummingbirds. 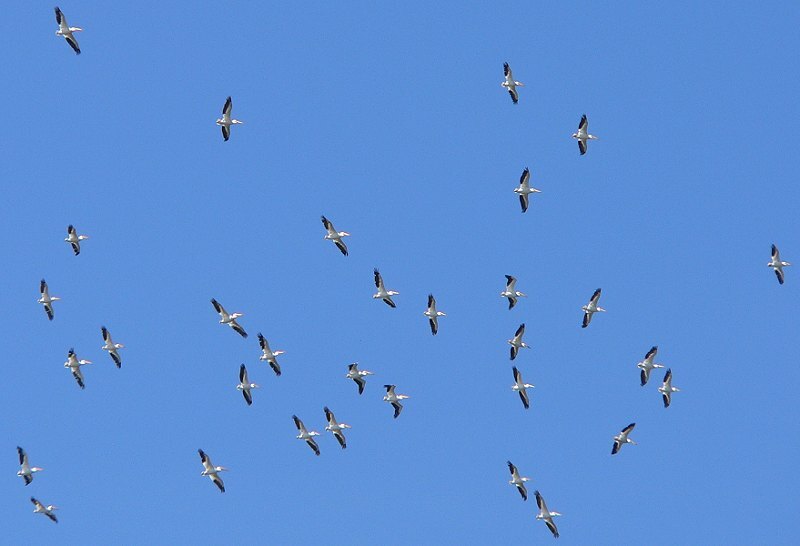 I went on a seed collecting trip this week and saw a large flock of Pelicans above Maiden Rock. I also collected seeds from our wetland. 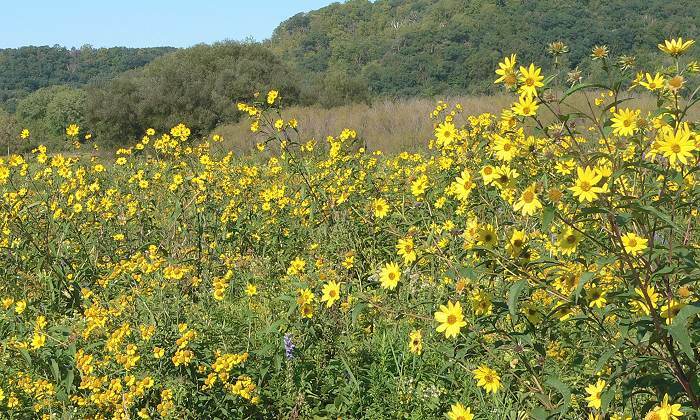 The first of the wetland areas that we sprayed and then planted with natives is full of blooming Swamp Sunflowers (Helianthus giganteus). We had the last section of Western Field sprayed with Roundup yesterday, so it will be ready for planting this winter. 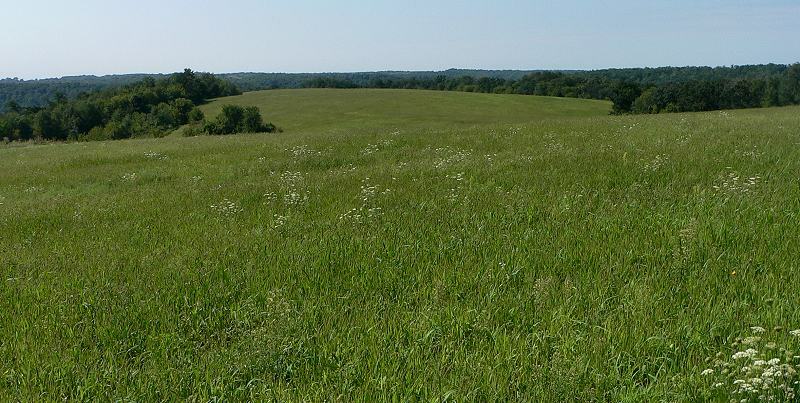 This is the section that was sprayed, taken from the highest point on our land. 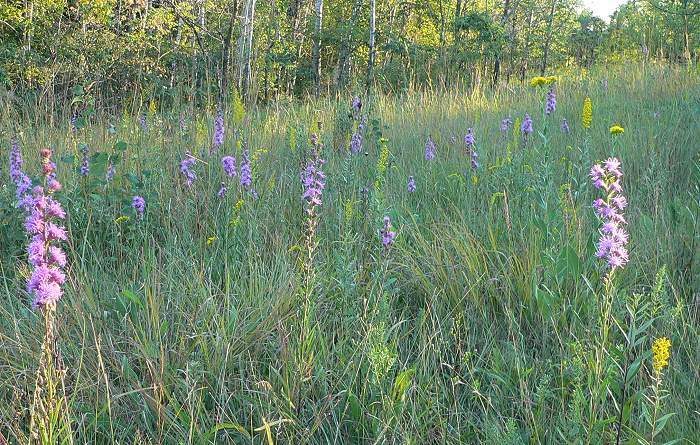 It will be wonderful when it’s all prairie. 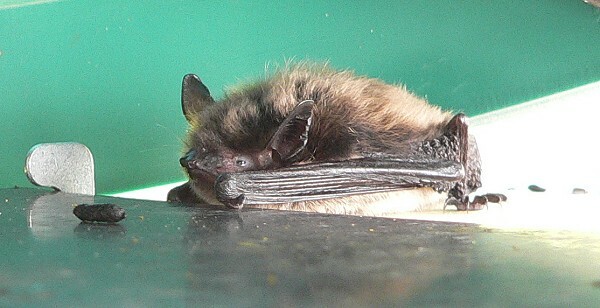 When I emptied the birdbath this afternoon I found a bat that had taken refuge in the narrow space between the bowl and the railing. We haven’t put up our bathouse since the deck was rebuilt – I guess we’d better get busy and put it back.